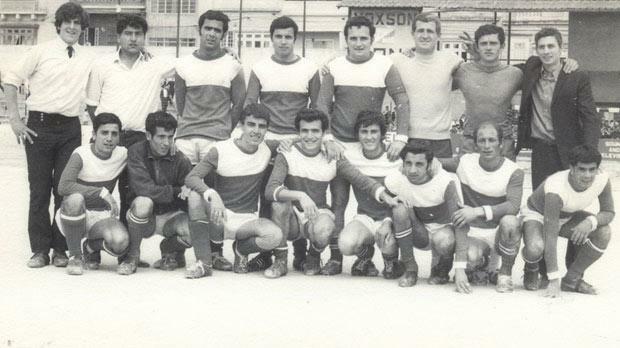 Players and officials of Msida St Joseph prior to a league match during the 1969-70 season. Msida is one of the oldest football districts in Malta. This locality has been figuring in the Maltese national league by one team or another since 1909 when St Joseph’s United took part in the first-ever championship. The present team, which represented Msida from 1955-56, has had many ups and downs as they spent a big part of their life in the Second and Third Divisions. However, there were a number of bright spots in local football history when Msida reached the top division. Msida first won promotion to the top flight in 1966-67 when they won the Second Division cham-pionship. In those days, it was very difficult for a promoted team to hold on to its hard-won place in the First Division. Most promoted teams slid back into the Second Division after only one season. Msida were no exception and in 1968-69 they were back in the Second Division. However, they were determined to make a quick return to the First Division. The 1968-69 Division Two league was dominated by Qormi, Marsa and Msida. It was a very keen and close campaign and at the end only two points separated top team Qormi from Msida and Marsa. The latter two finished equal on points and a decider was necessary to select the ones to accompany Qormi into the First Division. The decider was played on April 13, 1969. A sizeable crowd filled the terraces of the old Empire Stadium and there was great excitement among the crowd as referee Paul Bonnett signalled for the start of the game. At first, both sets of players were too excited to produce any good football but, as the game progressed, play improved and those present were rewarded with a Sunday morning feast of good football. In the first half, both teams had their chances but it was Msida who opened the score. Three minutes before half-time, Fitzgerald hit a hopeful ball upfield. Vella failed to clear and Henry Mifsud found himself with a clear way to goal. He raced into the Marsa penalty area and let fly a shot which sailed past the stranded Marsa goalkeeper and into the net. In the second half, Marsa lifted their performance. They moved forward with more purpose and for a while it seemed that they would score an equaliser. The Saints, however, defended well and when it seemed that the game would end 1-0, Msida scored again. Mifsud steered a perfect corner across the Marsa box. Ellul flicked the ball to Bugeja who only had to tap the ball into an empty net to make it 2-0. With promotion secured, Msida now turned their attention to the Division Two cup competition. Qormi were favourites to add the KO title to their championship trophy but fell in the first hurdle against Żebbuġ Rangers, leaving the way clear for Msida to reach the final. In the quarter-finals, Msida beat Żejtun 3-0 before disposing of Marsa 2-1. Then, in the final, the Saints beat Żebbuġ by a single goal scored by Scerri just before the end of the first half. This match brought to an end a very good season for Msida St Joseph. The Sixties were very good years for them in which the club was either in the First Division or, at least, hovering around the top spots in the Second Division.